Italian Sausage Tomato Orzo Soup: variation of Italian Wedding Soup! The summer season is almost officially over, school’s back in session, we’re busy-busy, and soup season…is pretty much here. 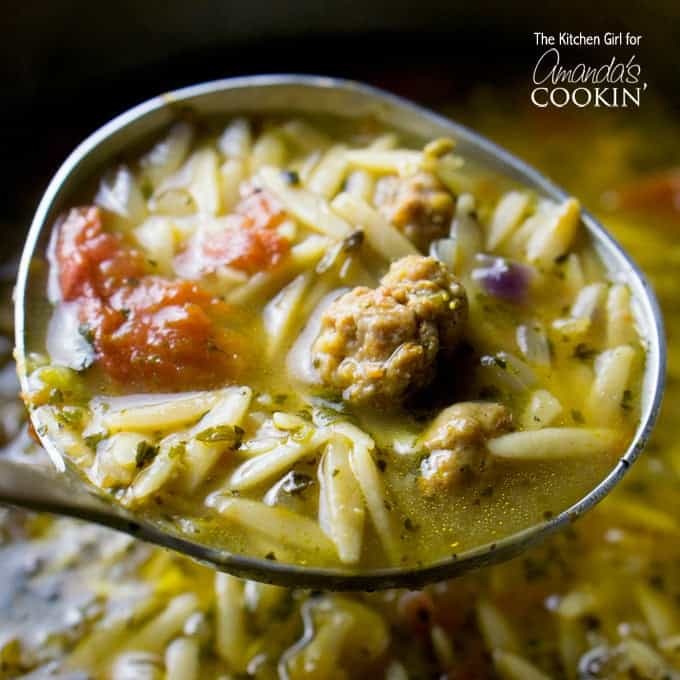 Here’s an easy, savory, recipe for Italian Sausage Tomato Orzo Soup to add to your weeknight meal rotation. This soup is the ultimate comfort food. It’s a broth-based, one pot, savory soup that requires only a few basic cooking techniques to reach maximum yum! The sausage and tomatoes give it a sweet and savory flavor while the orzo delivers that pasta-shaped-like-rice goodness that everyone loves. The seasonings, especially fennel, put the finishing touch on this Italian-inspired recipe. It’s a filling soup, yet hangs out on the light side because there’s no dairy added to the broth. 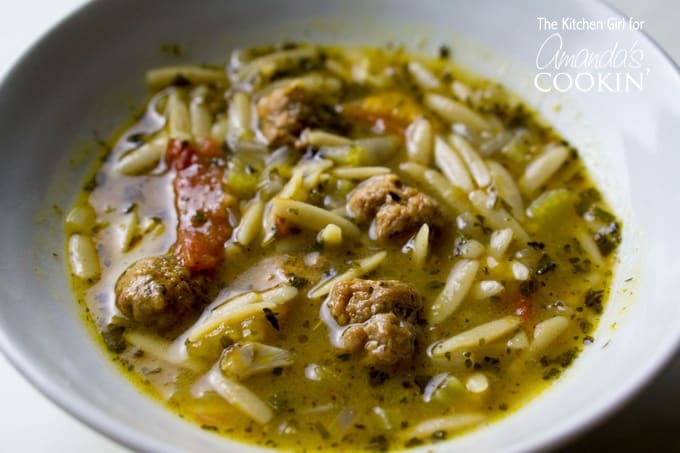 Have you ever had an Italian Wedding Soup? This one has a very similar look and feel, but uses Italian sausage instead of meatballs. You’ll also notice that we didn’t add any fresh, leafy greens to it. You know, like kale, spinach, or chard. And you’d only be upping the nutritional value. If you decide to add any greens, just toss them in near the end of the cooking cycle and they’ll cook to perfection. You could also have even more fun and add croutons and shaved parmesan cheese. Or if you love fresh bread from the oven, this homemade Italian bread recipe is a perfect accompaniment! 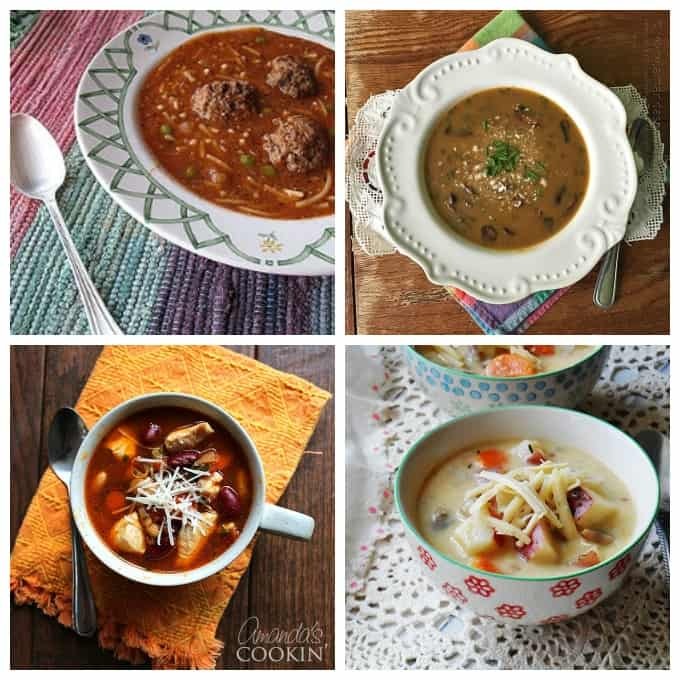 Of course, you’d be upping the calories, but who doesn’t love bread, cheese, and soup?! Although, I originally wrote this recipe without those party favors…to keep it on the lighter side. If you want more quick soup recipes for busy weeknights, check out my 30 Minute Chicken Tortilla Soup. If you’re really pressed for time and need a 20-minute soup, check out my In-A-Hurry Kale Chickpea Soup. 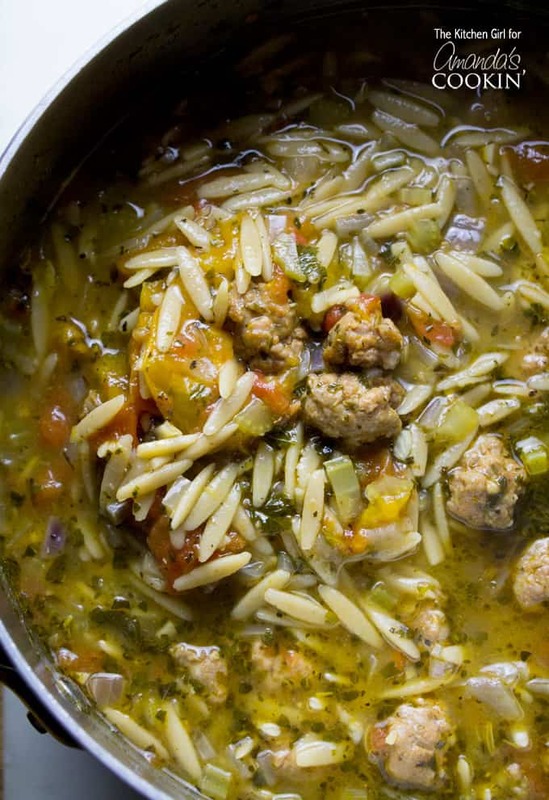 Both recipes are as easy as this Orzo soup. Sopa De Fideos is bursting with delicious classic flavors of Mexican Noodle Soup. A must try! 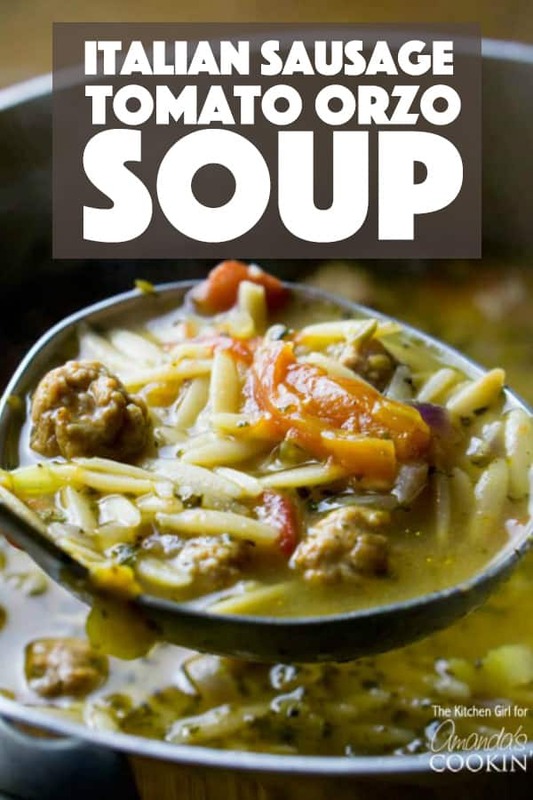 Amanda’s Meatball Soup is easy to make and makes a delicious, hearty meal. Great for fall! This Sausage Mushroom & Wild Rice Soup is very tasty and is less than 200 calories per cup. Another delightful broth-based soup is this Chicken and Bean Soup. Easy to make and wonderful for lunch. Rustic Garlic Potato Soup is ideal for chilly days. It keeps well in the refrigerator and can also be frozen for future meals. Vegetable Rice Soup, this easy one-pot soup is great for filling up on those good-for-you veggies! 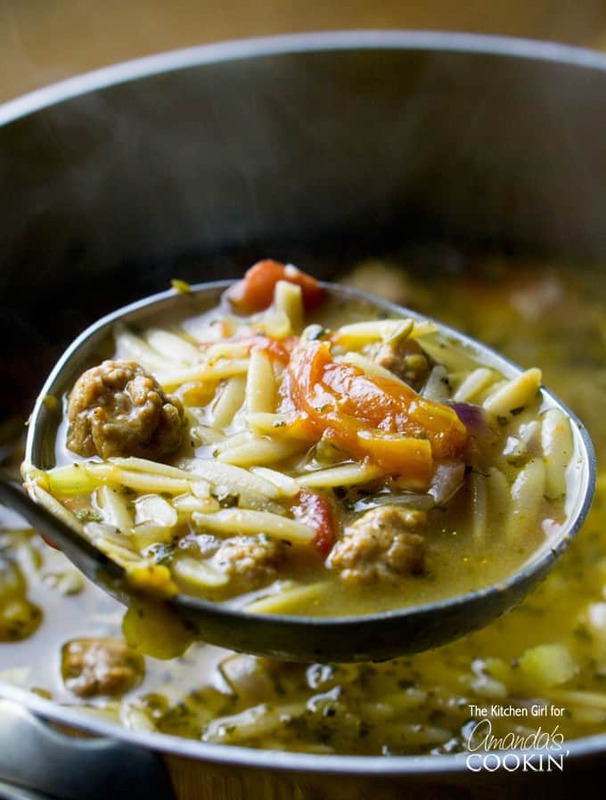 Think of an Italian Wedding Soup with all-pork sausage meatballs. This savory, comfort soup is on the table in only 30 minutes. In a 3.5-quart soup pot on medium-high flame, heat olive oil until shimmering (about 1-2 min). Add sausage pieces and sauté until lightly browned; transfer cooked pieces to a plate and set aside. To the heated, oiled pan, add onion, garlic, and celery; sauté until fragrant and slightly tender, stirring as needed (3-4 min). Add orzo; sauté to lightly brown (2-3 min). Add chicken broth, water, diced tomatoes (with their juice), Italian seasoning, oregano, fennel, salt, and pepper. Bring to boil; continue boiling until pasta is cooked through (about 10 min); add sausage back to pot about halfway through boiling process. This post was originally published on this blog on Sep 13, 2016. Could I use a large can of Crushed tomatoes instead of diced tomatoes? I’m not a tomato person, but I do use the crushed ones. This soup sounds amazing, and I want to make it. Fabulous! Love this soup! I use a lb of sausage because I love it. Next time I will try 3/4 cup of the orzo so I have a little more broth. I omitted the fennel cause I didn’t have that nor could I find it at my local store. Paired it with some garlic sourdough bread. Delicious! Thanks Cindy! I actually just made this again the other day. My mother in law is in town visiting (my daughter just got married) and she loved it too! Is there a difference in using Italian sausage in the casings verses buying it in bulk? This soup was very tasty! It definitely did not fit in my 3-qt soup pot – maybe you meant 5 qt? Hi Andi! Woops, that should have said 3.5 quart… I can see where the 3 QT presents a challenge since the liquids alone yield about 9 cups before simmering. So, a 4 QT will work fine for this recipe, but if you prefer a really roomy pot, definitely go for the 5 QT. Thanks for bringing that to our attention, I’ve corrected the recipe. Awesome recipe……. used hot italian sausage, added baby spinach, and substituted farro for the orzo ……. so good! thanks for sharing ! Made this soup this evening.. So flavorful and yummy!! I added Tuscan Kale for some color and used a spicy chicken sausage.. I will definitely make this soup again and again.. So glad you enjoyed it as much as we do, thanks Jason! Doubled the recipe since I had little more than a pound of sausage. Browned sausage and put all in but pasta in crock pot to cook all day hope it comes out good. Also was going to freeze some just going to leave out pasta till I eat it next time. I made this recipe this evening. I followed the recipe exactly, except that the sausage was Italian made with ground lamb. I had to substitute Greek seasoning for the called for Italian seasoning. The result was superb, delicious. 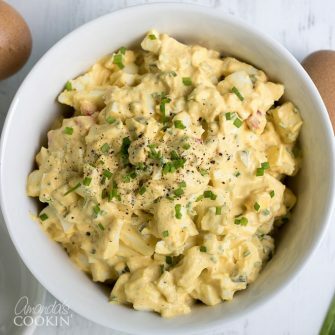 I will make this recipe many times as it has earned a place in my “favorites” file. Many thanks for sharing! Delicious! My family loved it…making it again tonight!! This soup is soooo tasty!! I used the entire 1 lb. package of mild Italian sausage as well as following others’ suggestions to cook the orzo before putting in the soup. I cooked the orzo in chicken broth and used what was left in the pot in lieu of the water called for in the recipe. I didn’t have any fennel, but didn’t miss it. We loved it!! I give it 5 stars!! This is a huge hit in my house! I only had Original Rotel on hand and it was perfect for my spicy family. Thank you!!! Do you think this would freeze well? Or would the orzo be too mushy? Your picture doesn’t look as many tomatoes as mine. Did you add less for pictures? Hi Susan. No, we didn’t add less…it’s just how we staged it. But if you find it’s too many tomatoes, you can cut it in half and use one can. Thanks for asking! Hi I was wondering if the seasoning measurements are right for the oregano and Italian seasoning, it looked like a lot of seasonings floating on top when I put them in. Will they all get absorbed somehow? Does this serve more than one as states? I was making for company!